So it's finally game week. Michigan players and coaches assemble in NOLA tomorrow, but there's already a ton of stuff to discuss about the upcoming Sugar Bowl, so let's get to it. Big Jon Falk in the Big Easy? Why, yes please. Amazing to see all the behind-the-scenes work that goes on to move virtually the entire program, coaches, players and support staff all down to the bowl game. So much work. Props to Tulane for being so accommodating. According to Michigan coaches, Michigan players deserved the much-needed 4-day Christmas break. But the big guys will probably spend much all of those 4 days shoveling cookies whole turkeys into their mouths, so whipping them back into shape in NOLA is going to be important. And in case you missed it, Mike Martin took 4 seconds out of his day to wish you all Happy Holidays. As usual, Michigan coaches have been busy, and some one of their duties in getting ready for the bowl game is talking to us. Al Borges, Brady Hoke. Not a mystery to most Michigan fans as images of the special uniforms the Wolverines will wear in for the bowl game have already been released, but I haven't mentioned them yet. First impression is mixed for me. I like the look, mainly because I really don't like the current away jerseys we have, so anything different is a step in the right direction. I also like them because it looks like we're heading back in the right direction towards arm stripes we had in the early-mid 90's. Props to Oregon though, their Rose Bowl jerseys are freaking awesome. Just a side note to Adidas, you're comp image above looks like blurry garbage compared to the Oregon comps from Nike. Just sayin'. Ticket sales have been good, but some still remain on UM's website. Word was that of the 17,500 allotment, over 15,000 have been sold, so hurry up if you have $125 burning a hole in your pocket. But of course there are other better/cheaper venues to purchase tickets from...which it seems like a lot of fans are doing. The same can not be said for VT. Ticket sales have been less than good on their end. But that's just what we're hearing from the official VT allotment from the Sugar Bowl. Someone hasn't been very nice this year. I hope Santa reads the Washington Post. 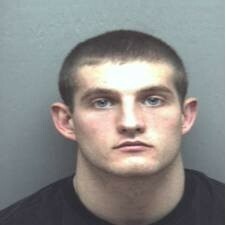 Virginia Tech kicker Cody Journell has been suspended indefinitely after being charged with breaking and entering. Blacksburg Police say the 20-year-old Journell was one of three men charged Wednesday night after an alleged home invasion. Police said the men were arrested after officers responded to a report of a “physical altercation” at a house near downtown. Journell was 14 for 17 in FGs this year. And you can bet that "suspended indefinitely" includes the Sugar Bowl. I don't know about you, but seeing as how VT's tickets are exactly flying off the shelf, and now their kicker was just arrested, but I think the Sugar Bowl has got to be rethinking their decision to invite the Hokies to NOLA. Especially since Boise State just blew out Arizona State in the Las Vegas Bowl. 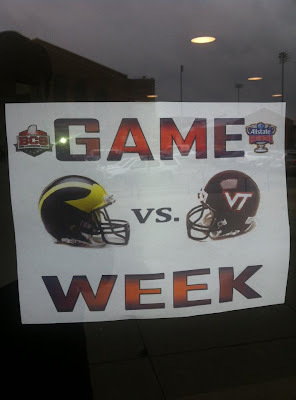 Why yes, there are rumors of some sort of big announcement tomorrow from Michigan. No word yet as to specifics. But rumors are definitely flying around.